Like most people who go in for the whole tea experience, particularly the British kind, I have an incurable sweet tooth. When I am drinking tea with an especially sugary accompaniment, I try, for the sake of my teeth, to keep my tea unsweetened. Seriously, two root canals in the space of one decade! Even with dental insurance the costs of both could have gone to the next visit across the pond. Don't feel sorry for me - it's been less than a year since I was in London. And here's one of the sweetest memories of that week. I'm a huge fan of grocery stores in other countries. It's the closest you can get to actually going into people's homes - unless you're actually staying with them, and this time I was at a hotel. Even though I live in Queens, New York, where you can find groceries of nearly every ethnicity, there's always going to be something you don't remember seeing in Key Food. 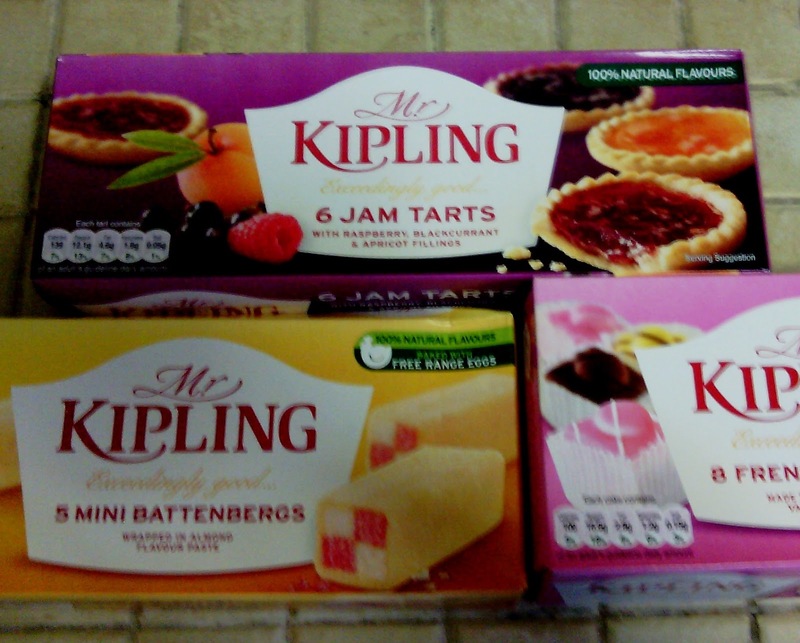 This time around, I saw these boxes of Mr Kipling in Sainsbury's and thought, well that's new. New to me, anyway. 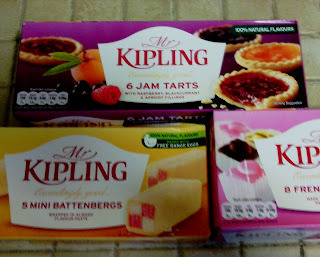 The stomach being as it was, I opted for only one box of little treats: the Apple and Blackcurrant pies. It sounded different enough, but not bizarre or too sugary. There is a limit. These little pies ended up being my sort-of breakfast in my hotel room, my telly-watching day-planning morning tea ritual. Some days it was the only thing I'd have for hours. And they were good. Not a-MAZ-ing, but what I needed to start the day. Plus, you don't see much blackcurrant in American treats, so it's a novelty. The jam tarts were my favorite. Like Jammie Dodgers (which I will discuss in the near future), the jam portion is just sweet enough, and so English you can't help but sit down for a brief tea break. I think for this reason the jam-filled items will be my preference. The crust was just right too. I'd heard of Battenberg cakes before, and can't say I've tried the genuine article so I won't compare these minis to them. Honestly, the first one I tried was not entirely pleasant. It was cloyingly sweet. The icing has an almondy flavor, which actually improved after it was refrigerated. I can't see buying this one again anytime soon. 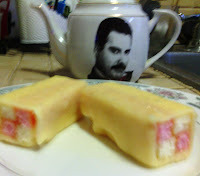 Good dipped in tea, though - hi Freddie! I can say the same for the French Fancies. They just hurt my teeth. The icing was not just sweet, it was too hard. The little bit of cake inside was not worth it, and neither was the poor excuse for cream filling. Now, this brand tends to not be as processed as some I've come across in the U.S., but there's no reason to go into denial. These are all better as small treats, almost candy. I've decided to enjoy these in moderation, but it helps to be able to narrow them down to the ones I know I'll like. And I can't do that unless I try them! I take it from this post that you havent't found any Twinkies yet?